For the superstitious among us, a black cat is usually a bad omen, but for photographer Alison Mees spotting a sooty feline was a stroke of good luck. While on an afternoon game drive in Tanzania’s Serengeti National Park, Mees came across a rare sight: a pitch-black serval foraging in the long grass. Initially unsure of what she’d found, Mees was able to capture a few photos of the cat, which later helped to identify the rare feline. ”We watched it walking and trying to hunt in the grass for around 40 minutes,” says Mees, who manages a camp in the Serengeti when she isn’t snapping images of wildlife. 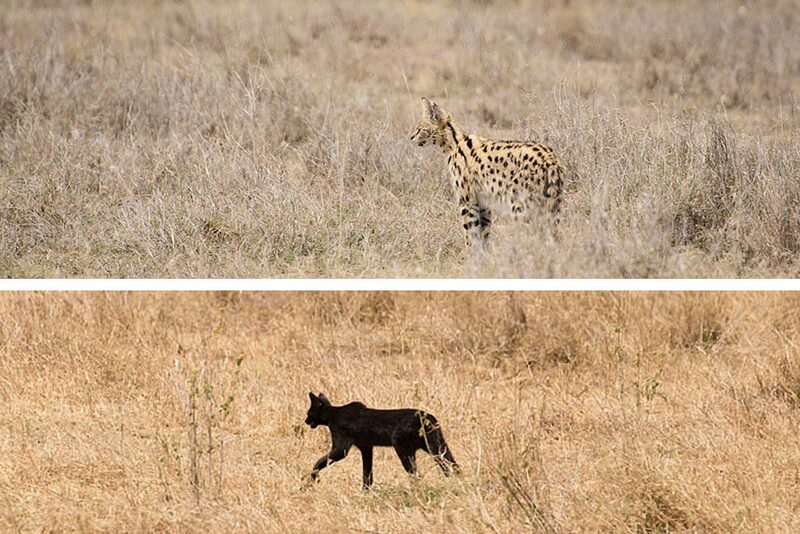 “Looking at the photos we realised it must have been a melanistic serval,” Mees told Africa Geographic, adding that this is the first time she has come across a black serval in the Serengeti. Servals usually sport golden coats with black spots, bands and stripes. Although these slender cats are found in most African countries south of the Sahara, there are only four known locations on the east of the continent where you might run into a population of black servals. These shadowy creatures owe their dark pigmentation to a genetic condition called melanism. The reasons for the unusual adaptation are still a bit of a mystery, but the condition is certainly not unique to servals. Melanism has been recorded in at least 13 of the 37 known feline species worldwide and although it is general considered to be maladaptive, experts believe that in instances where the condition is more common, the black pigmentation provides some kind of survival advantage. In the case of servals, melanistic individuals are usually spotted at higher elevations where it’s believed that the dark colouration could help the cats retain body heat in their chilly alpine habitats. 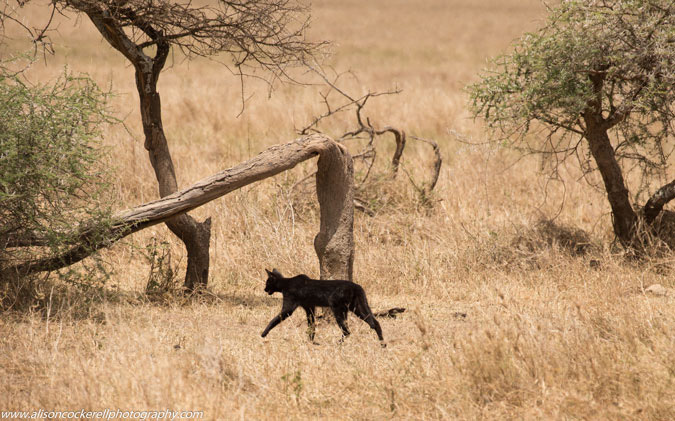 Interestingly, the serval spotted by Mees was foraging in the lowlands suggesting that either these black cats are moving out of the mountains, or they are spreading their melanistic genes to populations that live at lower elevations. We’ll leave that to the experts to figure out.